Halftime entertainment consisted of the baton/dance team including members from NB. I know Zoey and Allison Beauprey are in it along with the McCartney girls and Olivia Matthes. Fri 2/8 Van Buren (home), 6:00 – Hall of Fame Induction! Inductees: Ricci Emahiser (Softball), Brittany Lee (Track & Field), and Mike Roach (Basketball). February 8, 2019 will be North Baltimore’s Sports Hall of Fame Dedication before the Boys’ Varsity Basketball game vs Van Buren High School in The Jungle. Part of the ‘Living Through Loss’ Series at Blanchard Valley Hospital…. COLUMBUS, Ohio – All-session tickets for the upcoming Ohio High School Athletic Association girls and boys basketball state tournaments go on sale Friday, February 8, at 10 a.m. Tickets will be available atwww.Ticketmaster.com (search OHSAA) or via phone at 1-800-GOBUCKS. Tickets will also be available at the Schottenstein Center ticket office. Registration for all incoming kindergarten students who will be 5 on or before August 1, 2018 will begin on March 1, 2019. Registration should be completed by May 1, 2019 so parents can participate in several important events before school starts. There will be a mandatory parent meeting April 16, 2019 at either 5:00 or 6:00 pm. No children are needed at this meeting. You can sign up for this at the board office when dropping off documents. Kindergarten screening will take place August 6, 2019 from 1:00-5:00pm and August 7, 2019 from 9:00 am–1:00 pm. These are scheduled in 20 min slots and can be signed up for at the Board Office. If you have any questions, please call Kelly West at the NB Board Office – 419-257-3531. COLUMBUS – We’ve gone from sub-zero temperatures to highs near 60 degrees in parts of Ohio within just a few days. Mix in some rain and snow and conditions are perfect for the formation of potholes. 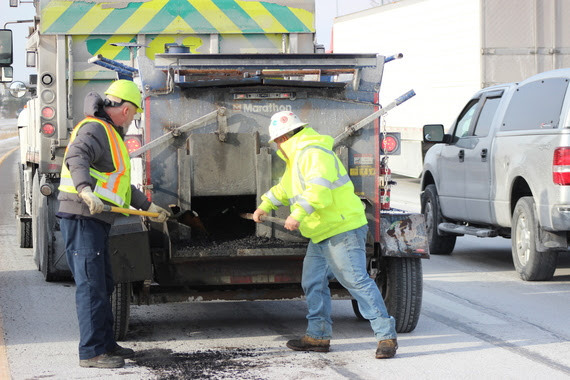 Already this winter, ODOT has used 2,574 tons of asphalt to repair potholes. That’s up from 1,892 tons at the same time last year. Our crews have spent more than 39,000 hours – equivalent to 70 years – patching potholes this winter. Potholes on ODOT-maintained roadways, which include state and U.S. routes outside of municipalities and all interstates, can be reported by clicking here. Potholes on local roadways should be reported to the agency responsible for their maintenance.